Hey boo-thangs! It's Thursday and I'm feeling it! A lil' update on my vida: I've been promoted at work and went from being temp to being full full full time, which means, yay benefits but also hello crazy workload! It's almost like starting all over again, since now I'm working in a new division and basically need to build my network from scratch again, which means way less time to work on my little love: this blog. Either way, I refuse to quit, so here I am today bringing you guys one of my favorite shoots we did with my friend (and awesome photographer) Johnny back in November. Either way, I'll leave this here as spring inspo for all my New Yorkers, and as wear-now inspo for all those who can! So in love with your look!! 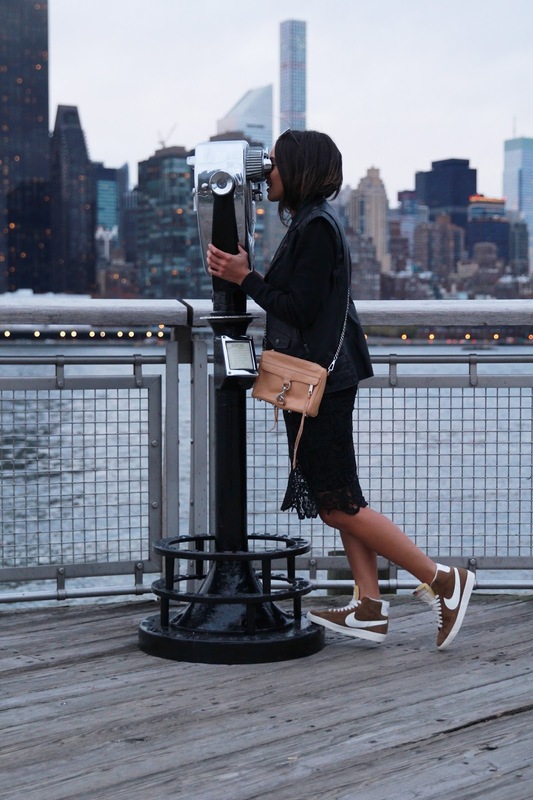 The lace skirt looks amazing with your sneakers - street chic! Thank you Chelsea! So crazy that I once worked with a girl that had your same exact full name! Congrats on your full time gig! OBSESSED with your sneakers and how you paired this with this skirt. Thanks doll! It's a lot but I'm super excited for the challenge! Obsessed with these photos and this outfit!! I love the lace and sneakers combo!! I love your style, its really cool! Your photos are really nice! ohhh esa falda es amada querida!!! Buen look!